Read how you can win $500 with an 80% probability, playing with a roulette strategy! Roulette is a classic casino game, where you play against the casino. 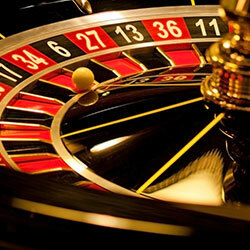 The game consists of a wheel, which, in European Roulette is divided into 37 numbered spaces from 0 to 36. 18 of the fields are black, 18 of the fields are red, and a single field (0) is green. In American roulette, there’s an extra field (00), but since the payout of winnings is typically the same, the probability of winning in the American game is reduced compared to European roulette, which makes dealing with it any further uninteresting. In addition to the wheel, there is a game board, where bets are made using chips. All calculations on this page are based on the European version of roulette, which has 37 fields of play. You can set up many different game combinations on the board. You may focus, for example, on “red”, “even”, “black”, “odd”, but also on specific numbers or a variety of numeric series, such as “1-18” and “19-36”. Obviously, your payout increases with a decreased likelihood of your bet coming out a winner. 2.72%. Note that this is about predicting one game sequence of 5 games before having played the first game. It does not mean that when we get to 4 out of 5 games, the probability of hitting “black” is 2.72%. Coincidence has no memory! When the probability is calculated over several games, the starting point is always looking at the entire game series as one probability without breaking it up during the game. 2.70% is the probability of hitting a randomly selected number. What, then, is the probability of hitting “8” twice in a row? It’s 0.073% – meaning very, very low. Below is a schedule of probabilities for hitting the same color between 1 and 10 times in a row. This casino advantage applies generally to all bets that can be created on the board. In terms of gaming psychology, this will often play out a little differently, because the tendency is to continue the game until all is lost, or until the player has increased his starting money amount significantly. In other words, few people play roulette with $1000 and leave the table an hour later with $800 or $1200 in their pocket. A good roulette tip is therefore, that you should always set an amount you can afford to lose, and set amount of money that you are satisfied with winning. This was the first game series. Now, we’ll start over for the next game series. As you can see, each successful game series means that you can add your starting wager to your balance. Although six out of eight games were lost, the roulette wheel still left you with a profit. With $512 at your disposal and an initial wager of $1, we will therefore be able to win $1 in 99.9257% of game series. The disadvantage is that the probability of losing $1023 is 0.0175% for each game series. There is a 81.44% probability that you will earn $250 by playing the martingale roulette system. In other words, 4 out of 5 will make $250, but at the expense of the last person, who will lose $1023. There is no “hocus pocus” involved with the martingale roulette system – it is pure mathematics! Depending on your risk tolerance, you can change the start deposits to $10 – where you can multiply the amounts by 10 – meaning you can earn $2500 with an 81.44% probability. If you would like to try martingale in real life, you can do so on a smaller scale. You don’t have deposit $1023 into your gaming account first off. Let’s see how the math looks, if you don’t want to gamble with more than $255. The probability of earning $100 playing roulette is 68.65%. If you have the courage to try out the system in real life, you can create a profile with 888casino. We recommend that you deposit at least $250 to your account. You can see how the Martingale System is used in action here. Deposit bonus – good or bad? Most casinos offer a first time deposit bonus. Typically, this means that they double your first deposit. If you deposit $500 to your gaming account, the casino will add another $500 for you to play with. Effectively, this means that you increase your chances and minimize your risk. The disadvantage of these bonuses is that you have to “play them through” a certain number of times before they are payable. Normally, the games you play on the roulette are not included in this. However, you can easily spend your money – your winnings, your initial deposit, and your welcome or deposit bonus – elsewhere in the casino, if you plan on playing anything besides roulette. This applies to all games. Never play for more than you can afford to lose. If you are addicted to gambling, you can get help here.